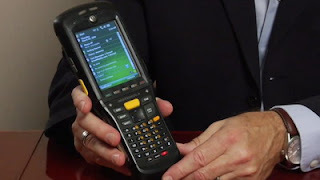 The Motorola Solutions business of Motorola has announced the MC959B mobile computer - the industry’s first industrial handheld mobile computer that allows mobile workers to easily select the wireless network that best meets their needs. The MC959B is a data-only device and offers a dual 3G WAN modem that enables enterprises to deploy the device on multiple networks and switch between 3.5G GSM HSUPA and 3.5 CDMA EVDO Rev A connections. The newest addition to Motorola’s premium-class MC9500-K series, the MC959B provides the flexibility enterprise organizations need with true WAN technology independence in the field. The new MC959B is one of the first handheld industrial mobile computers to incorporate Qualcomm’s Gobi connectivity technology – one of the first embedded mobile wireless solutions designed to put an end to connectivity limitations. The new MC959B via MAX FlexWAN enables enterprises to deploy and later re-deploy the devices on virtually any 3.5G network, simplifying purchasing and device management. The MC959B is the industry’s most rugged mobile computer and designed for mobile field workers - including those in the transportation and logistics, parcel/post, direct store delivery, field service and public safety industries - who work in large territories with coverage areas that may be best served by different cellular networks. Motorola’s newest offering delivers reliable performance and can be activated on the enterprise network of choice and switched between multiple networks to ensure connectivity throughout the business day. Designed to improve operational efficiencies with superior ergonomics, the MC9500-K series of mobile computers, including the new MC959B, offers an unsurpassed feature set in a sleek and reliable form factor for enterprises demanding the most versatile and rugged solutions. 0 comments on "Motorola MC959B rugged mobile computer debuts"